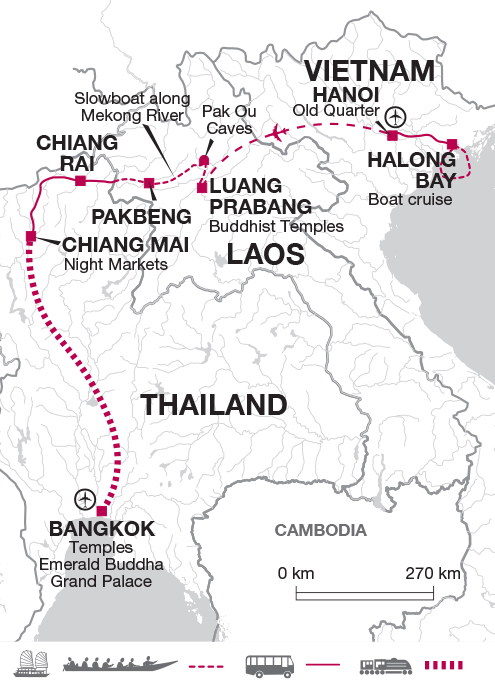 This exciting journey takes us from bustling Hanoi and beautiful Halong Bay in the north of Vietnam to laid-back Luang Prabang in Laos; and by slow boat into northern Thailand. We journey through Chiang Rai and Chiang Mai before finding ourselves in Bangkok, one of Asia's most exciting cities. We get happily lost in Hanoi's Old Quarter, spend a night on a boat on Halong Bay and explore Chiang Mai's walled Old Town. Join tour in Hanoi. Later today there may be the option to see a performance of traditional water puppetry, a practice that dates back to the 15th century. Set on a flooded stage, the stories tell tales of legendary heroes and everyday life, with dragons and unicorns sharing the stage with ducks and frogs, and even fireworks and naval battles! We drive around 4 hours by charter bus to the incredible setting of Halong Bay, one of Vietnam's most spectacular natural attractions recently voted as one of the eight natural wonders of the world. A UNESCO World Heritage site, Halong Bay boasts hundreds of jungle-clad islands (over 1600 at the last count) that rise from the jade green waters of the bay like the scales of some great submerged dragon. Indeed Halong means 'where the dragon descends to the sea' and local legends tells of a time when this rugged landscape was created by the pounding tail of a mighty dragon as he ran from the mountains into the glittering waters of the bay below. On arrival we will board our shared junk boat and set sail, threading our way through a flotilla of boats, junks and wooden sampans as they ply their way across the gentle waters of the bay. We spend the night on the boat. This morning we continue to enjoy the romantic scenery cruising amongst the islands as we return to the jetty. It is interesting to see the assortment of boats, junks and wooden sampans, their sails hoisted, gliding through waters. We then drive back to Hanoi where this afternoon we take a walk through the Old Quarter. This is a maze of narrow streets that are named after various crafts or specialties: Paper Street, Silk Street, Basket Street etc. The shops themselves have very narrow frontages but are actually quite deep; they are known locally as 'tube' shops. Street vendors tempt you with noodles, snacks and stir-fried delights from shoulder panniers, all adding to the charm of Hanoi's historic heart. This morning we fly to Luang Prabang. The remainder of the day is free to enjoy this lovely riverside town at your own pace. Home to the impressive Thad Makmo stupa (Buddhist shrine) and the beautifully ornate Wat Xieng Thong, Luang Prabang has a wealth of architectural highlights that include both traditional Laotian style and French colonial buildings. Perhaps you would like to try your hand at Lao cooking or simply relax with a coffee or a Beer Lao in one of the riverside bars and watch the world go lazily by. Today is also free. There is opportunity to explore further afield with an excursion to Kuang Si Falls, a stunning three-tiered waterfall with the opportunity for swimming. Today we board a slowboat to take us along the Mekong towards Thailand. Running form the Tibetan plateau, though Laos and Cambodia and finally meeting the sea through the Mekong Delta of Vietnam the Mekong River is the life blood of this region. By boat we can watch as the scenery changes, as we pass thick forested hills and riverine forests, along with glimpses of local life on the banks. We have the chance to stop off at Pak Ou caves, a shrine crammed full of Buddha images of all sizes and styles. We disembark to overnight in Pakbeng on the banks of the river. We continue on our boat journey enjoying the landscape as we go. When we reach the Thai border at Chiang Khong we are met by a new tour leader. We drive around 2 hours to Chiang Rai in the far north of Thailand very close to both the Laos and Burmese borders, in the area known as The Golden Triangle. This evening we recommend a visit to the night market to discover some of Thailand's delicious street food. Today we make the 3 hour journey to Chiang Mai visiting Wat Rong Khun, otherwise known as The White Temple, along the way. This is an unusual and quirky Buddhist temple as it is was designed by a contemporary artist who began construction in 1998. On arrival in Chiang Mai the remainder of the day is left free to make your first impressions of the city. This morning we take an orientation walk of the Old Town and see some of the many temples and the ancient city walls, as well as visit the market. This afternoon there is the option to drive out to Doi Suthep temple, and enjoy great views of Chiang Mai from its vantage point on the hill. This evening we pay a visit to the night market and bazaar, where there is plenty of opportunity for shopping. Today is free to enjoy Chiang Mai further. There is the option to learn some of the culinary secrets of Thai cuisine when taking a cooking class, have a relaxing Thai massage at one of the city's many parlours, or just enjoy a leisurely stroll along Chiang Mai's quiet streets, taking in its many temples. This evening we board our overnight train back to Bangkok. On arrival we transfer to the hotel. Your time in Bangkok is free. You may choose to take an optional cruise along the city's Klongs (canals) in a traditional longtail boat. This is the ideal way to explore Bangkok's network of meandering waterways that branch off from the main channel of the Chao Phraya River. The excursion will also include visits to the Royal Barge Museum and the iconic Wat Arun, the Temple of the Dawn, which was built to represent the towering slopes of Mount Meru, the home to the gods of Khmer mythology. Alternatively there is plenty of shopping and many bars and restaurants to enjoy. Tour ends Bangkok. If you are staying on there is plenty to see and do in Bangkok, there are also some great beaches within easy reach, either by road or by plane. Pack essentially for hot weather although December through to February warmer clothing is needed for the north of Vietnam. Days are hot and humid. Lightweight rainwear essential at all times. A torch, water bottle, insect repellent and high factor suncream are all essential, as are good quality sunglasses and a lip salve with sun protection. Don't forget your swim wear! An overnight bag is useful for the overnight train/bus. This exciting three country tour covers a lot in a short space of time giving a tantalising flavour of each destination visited. Ideal for travellers with less time who want to see a lot and who enjoy independent exploration as the tour has been designed with a lot a free time factored in to allow for flexibility. You will use a variety of transport, including planes, trains, buses and boats, giving a real taste of local travel as you journey from the tranquil waters of Halong Bay to the bright lights of Bangkok.